Boot off the Windows installation CD and select the Repair your computer option. Click Command Prompt from the list of recovery tools. I presume your OS is installed in drive C. Replace C with appropriate drive letter for other cases. In the CMD type the following commands one by one, press Enter after each. Now close everything and reboot computer. Once you get to the Windows 7 login screen, hit the Shift key 5 times, and you'll see an administrator mode Command Prompt. Type net user username password. Replace username with the name of your Windows account, and password with a new password. Exit Command Prompt and you can log in with your new password. 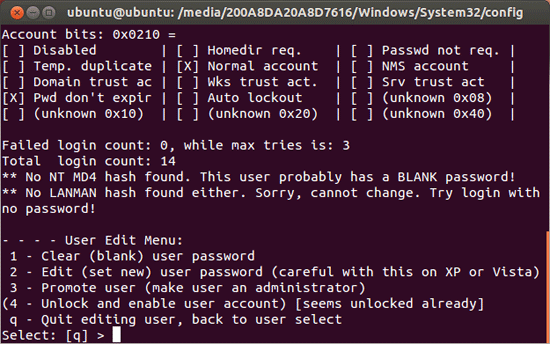 Ophcrack allows you to find out the user's password instead of bypassing it. When you boot from the Ophcrack Live CD, it automatically launches the graphical Ophcrack tool. It will list all the user accounts it has found on your computer under the User column, and attempt to recover Windows 7 user passwords. Unless your password is fairly complicated, contains lots of characters or you're on a dated machine, the tool shouldn't take long to crack your passwords. When it's done, the passwords are listed in the NT Pwd column. If the password field corresponding to your user is empty, there is no password for that user. Grab a copy of Ubuntu ISO image from its official website. Burn it to a USB thumb drive with ISO2Disc. Boot up your computer using that bootable USB drive. Open all partitions to find the drive that contains Windows installation. Note down the disk identifier from Nautilus title bar. In my case, this disk identifier is 200A8DA20A8D7616. This identifier will vary in your case. Change it accordingly in next command. Type cd /media/200A8DA20A8D7616. Hit Enter. Type cd Windows/System32/config/ and press Enter. Type sudo chntpw SAM and press Enter. You will get a menu with all users of the system. Default is Administrator. Type 1 and press Enter to clear user password. All of the above methods require you to run some Linux or DOS commands. If you're a computer novice, then PCUnlocker should be your better choice. Double-click the zip file to see its contents. When prompted, drag the pcunlocker.iso file out of the window to your desktop. Burn the ISO file to your CD (or USB drive) with the freeware ISO2Disc. Boot your locked computer from PCUnlocker Live CD. 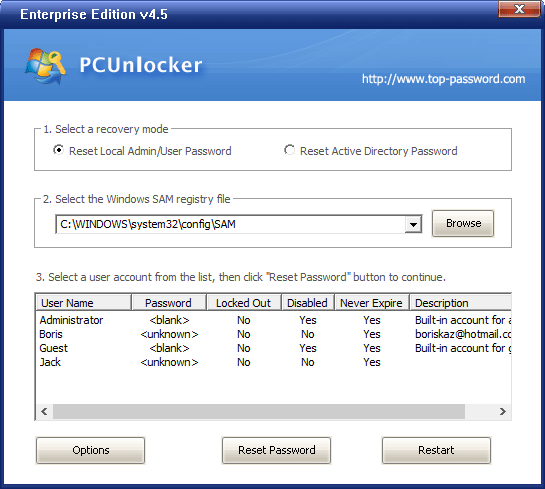 After the PCUnlocker program launches, select one of your Windows accounts and click Reset Password button. This program will unlock/enable your selected account, and remove the password immediately. Reboot to the Windows 7 logon screen and you should be able to login without typing a password! What to do if your computer doesn't have a CD drive and it also doesn't support booting from USB? Is it possible to reset lost Windows 7 password without using any disk? 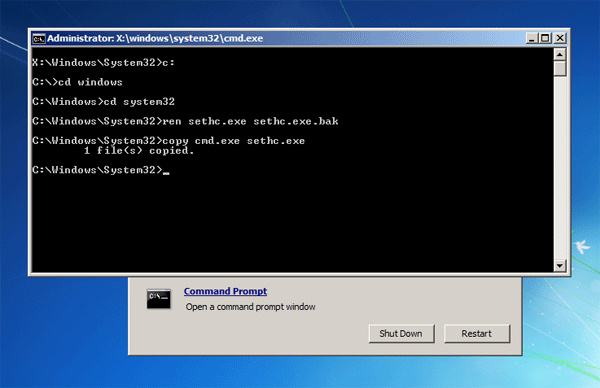 Check out this article that explains how to reset Windows 8/7 password through a backdoor. This backdoor has been around for a very long time and is not really an exploit which is why Microsoft does not intend to patch and block it.